#2 Common and Better Yellow Pine flooring is a traditional flooring choice. #2 Common and Better Yellow Pine flooring has lengths typically of 6 to 16 feet. Standard widths are 6, 8, 10, and 12 inches nominally. Custom widths from 3″ up to 18″ or more can be made by request. Moisture content is between 6% and 8% for quick acclimation. Yellow Pine is mostly found unfinished but is available prefinished and engineered with a veneer top layer. #2 Common and Better Yellow Pine flooring is readily available. Custom orders usually demand 2–3 weeks for production, depending on lumber availability. 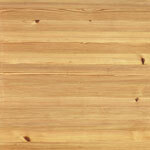 #2 Common and Better Yellow Pine has an even light-yellow color with large knots and defects. The long lengths make for fewer joints and a more desirable floor aesthetically. Yellow Pine is not particularly sensitive to sunlight but will amber considerably with an oil-based finish over time. Water-based finishes can be applied to slow any color change but may be difficult to use because of grain raise. Because it is priced lower than Oak, #2 Common Yellow Pine flooring is used in low-, medium-, and high-end residential applications for a traditional floor.